Naval Matters of World War II: Italian battleship Conte di Cavour sunk at Taranto, later salvaged but never returned to service. Italian battleship Conte di Cavour sunk at Taranto, later salvaged but never returned to service. The Italian battleship Conte di Cavour was one of a class of three Italian dreadnaught-type battleships dating from the First World War. As originally designed, the ships carried a main battery of thirteen 12-inch guns mounted in five center line triple turrets. They had a maximum speed of only 21.5 knots. 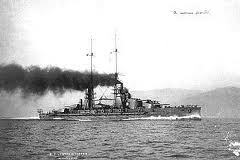 They were comparable to the latest French and Austro-Hungarian battleships. The Conte di Cavour and her sister ships saw little action during World War I, and by 1928 the remaining two ships (Conte di Cavour and Giulio Cesare) had been reduced to reserve status, their deficiencies and overall obsolesence being apparent. The third ship of the class, the Leonardo da Vinci, had been lost due to an internal explosion on August 2, 1916, though later salvaged for scrap. still in her World War I configuration and appearance. The Italians, under the leadership of Benito Mussolini, needed a strong fleet to project prestige and power over areas that Mussolini intended to rule or dominate. Plans were drawn up to completely renovate and modernize the Conte di Cavour and Giulio Cesare, and later the battleships Andrea Doria and Caio Duilio as well. In 1932, the French laid down two new battlecruisers of the Dunkerque class. In October, 1933, the Conte di Cavour was taken in hand at Taranto for complete reconstruction and modernization. The main battery was reduced in number, but was upgraded in caliber to 12.6 inch, along with increasing the elevation from 15 degrees to 30 degrees, with a corresponding increase in firing range. New secondary batteries and heavy anti-aircraft batteries were mounted, and an entirely new propulsion system was installed raising power and maximum speed from 21.5 knots to 28 knots. The new "pugliese" system designed to offer protection from torpedo hits was installed and built around the existing hull. The entire superstructure was rebuilt, and aircraft facilities were added. The ship, and later her sisters, were completely transformed into fast, powerful warships. appeared following her reconstruction and modernization. The Conte di Cavour rejoined the fleet in late 1937. She and her sister ship Giulio Cesare were fully operational when Italy joined the war in June, 1940. Shortly thereafter, both of these ships were involved in action against British warships in what later became known as the Battle of Calabria or Punta Stilo, which was a tactical draw. 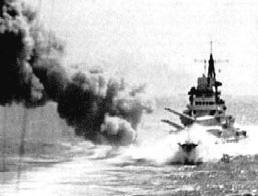 The Cavour briefly exchanged gunfire with the British battleships Warspite and Malaya, but neither inflicted damage or received damage herself. during the Battle of Calabria or Punta Stilo. On the night of November 11 - 12, the British launched operation "Judgement", which was an attack on the main Italian naval base of Taranto by swordfish torpedo bombers launched from the British aircraft carrier Illustrious. All six of Italy's battleships were moored at Taranto. The British launched two separate waves of torpedo bombers in the surprise attack. During the first wave, the Conte di Cavour was hit by one 18-inch aerial torpedo. This one hit blasted a hole in her hull below the waterline measuring approximately 39 ft x 26 ft. The Cavour began taking on water and sinking. Attempts to move her to shallower water were not successful, and she sank at her moorings with only portions of main battery and superstructure still above water. The battleships Littorio and Caio Dulio were also struck by torpedoes, but damage control efforts kept them from completely sinking. Initial salvage efforts on those two battleship were thus given priority over that of the Cavour. from a British swordfish torpedo bomber. Salvage work did eventually commence on the Conte di Cavour, including the removal of her heavy guns to lighten her. She was eventually raised in 1941 and drydocked at Taranto for five months for temporary repairs. On December 22, 1941, she was moved under her own power to the naval base at Trieste to receive permanent repairs. She was docked at the Montfalcone Shipyard at Trieste, sporting the "Claudus" camouflage scheme. The ship was scheduled to receive further modernization, including the installation of newer and more effective heavy anti-aircraft guns. Her repair work, however, was given a low priority. undergoing repairs and further modernization. Note the camouflage and part of her main armament missing. The Conte di Cavour's repair work was approximately 85% completed at the time of the Italian armistice in September, 1943. The Cavour was unable to flee, and she was seized at her moorings by the Germans. The Germans considered continuing her repairs or alternatively removing some of her heavy guns for use as shore batteries, but in the end nothing more was done with her. The Conte di Cavour came under attack by bombers of the United State Army Air Force on February 15, 1945, and sank at her moorings. She was subsequently raised in 1951-52 and scrapped. Although the Conte di Cavour was salvaged and under repair after the British attack, she never again returned to service. Thus, the British were entirely successful in eliminating this Italian battleship from the war in the Mediterranean for its duration.